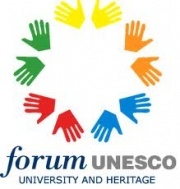 This UNESCO Chair expresses UPV's commitment to continue contributing to the preservation and enhancement of heritage in collaboration with professors, researchers, students and professionals of the FUUH Network. Therefore, we would like to share in this achievement and encourage you to continue participating and sharing your activities, programmes and projects in this network, as your contributions mean a great value to safeguard our cultural and natural heritage. - To disseminate your research and contact other research authors of your interest. - To search for and publish contents in the electronic Newsletter.